Annette “Chi” Hughes is always looking for family. Whether biological or surrogate, born from blood or mutual struggle, Chi finds love and support in a close-knit community. She found a family in D.C. by organizing fellow Howard University students, through performing spoken word poetry, and, more than anything, by daring to be open about her identity. When HIV reached Washington, D.C., Chi quickly used her gift for leadership to protect and inform her community, thus beginning a lifetime of service in social welfare. Chi was born in Alabama and grew up in Queens, NY. She arrived in D.C. in 1975 to attend Howard University. It was at Howard that she began to connect with other gay students; yet, a culture of fear was omnipresent. She recalls that the informal code on campus for gays was to avoid acknowledging any weekend social rendezvous, leaving students closeted and disconnected. Not a single black university in the country had a club for gay students when Hughes helped found the Lambda Student Alliance, only realized under threat of a lawsuit. Their mission was to be a visible organization, not to hide in undercover meetings. The Sapphire Sapphos helped introduce Chi to an arts renaissance among Washington, D.C.’s LGBT black community. It was the time when Chi experienced a highlight of her life as an artist. She performed spoken-word poetry with the legendary Essex Hemphill as the only female member of CINQUE and took the stage at the National Theater as well as underground arts spaces where the Sapphos sponsored events featuring poet Audre Lorde and the famed women’s musical group Sweet Honey in the Rock. She even sang with Sweet Honey in the Rock’s workshop group InProcess. Chi’s life was dramatically transformed by the unforeseen AIDS epidemic. She was in her mid 20s when the disease reached D.C., and she soon was offered a position doing outreach for Whitman-Walker Clinic. The work was often difficult. “At some point I actually felt like an outsider in the communities that I straddled,” she recalled. 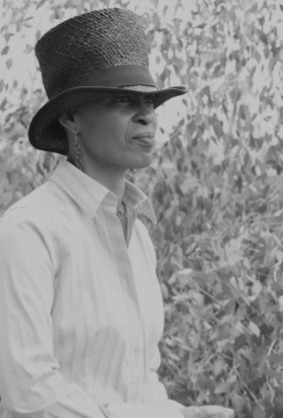 “If I was in the black gay community talking about HIV, people didn’t want to hear it, and if was in the straight community, people were asking, ‘Why are you talking about this white gay male disease?’ It was lonely work.” The task of directing meager federal resources to minority communities proved monumentally difficult, but it became her mission over the next 15 years. Fieldwork in HIV proved an entrée into understanding social issues ranging from homelessness to substance abuse and the ramifications of race and class. Chi was inspired to obtain a master’s degree in Social Welfare and turn this work into a lifelong career. Chi moved with her partner to Los Angeles in 1986 and became the first African American Deputy Director of the Los Angeles LGBT Center. She continues to work in the nonprofit sector as owner/consultant of ANetteWork. In 2014 she returned to the Los Angeles LGBT Center as the Manager of Social Services in the Senior Services department, again finding and fostering family.